Winner of MASNO’s 2012 New Orleans International Piano Competition, Viktor Valkov returns to New Orleans to give a Master Class at the New Orleans Center for Creative Arts (NOCCA) on Wednesday, November 5th at 2:00pm. Hall Piano Company, south Louisiana’s premier Steinway & Sons dealer, is sponsoring the event as part of their community development initiative. Master Class is complimentary and open to the public. Valkov has been highly acclaimed by the critics as “lion of the keyboard” and “sensational”. In the 2013-2014 concert season he performed with the Louisiana Philharmonic Orchestra, Baton Rouge Symphony Orchestra, and Acadiana Symphony Orchestra. Since 2002 Valkov has given a number of recitals in USA, Japan, Germany, Italy, Greece, Bulgaria, and Macedonia. A Japanese tour in 2002 took him to Tokyo, Toyama, Yokohama and Okinawa. In Bulgaria, Viktor Valkov appeared in performances with most of the major orchestras and at most of the important music festivals. In 2003, he received an invitation from the New Symphony Orchestra, and conductor Rossen Milanov, to perform Dimitar Nenov’s Grande Piano Concerto. Thus he became the fifth pianist to perform that concerto and the only one to do the entire version. In 2007, Mr.Valkov made his debut with the Sofia Philharmonic Orchestra. For additional information about Viktor Valkov’s Master Class at NOCCA, contact Emily McWilliams at emilym(at)hallpiano(dot)com or call 504.733.TUNE. 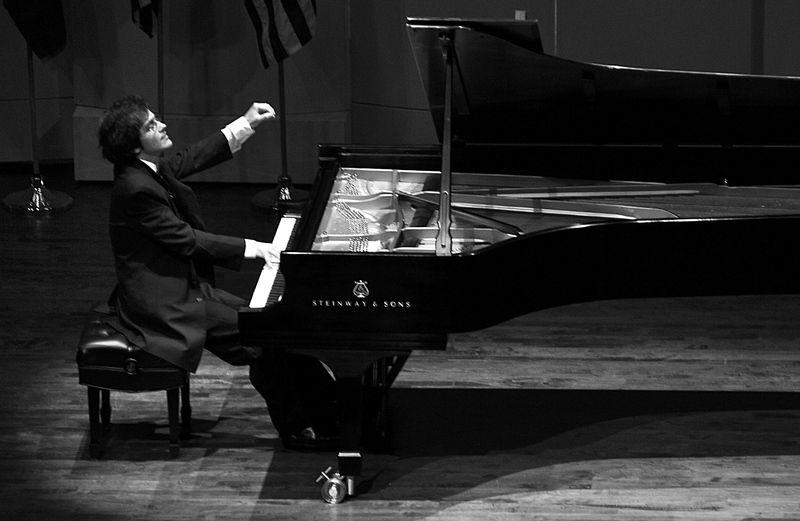 Winner of the 2012 New Orleans International Piano Competition, Viktor Valkov has been highly acclaimed by the critics as “lion of the keyboard” and “sensational.” In the 2013-2014 concert season he performed with the Louisiana Philharmonic Orchestra, Baton Rouge Symphony Orchestra, and the Acadiana Symphony Orchestra. Since 2002 Valkov has given a number of recitals in the United States, Japan, Germany, Italy, Greece, Bulgaria, and Macedonia. A Japanese tour in 2002 took him to Tokyo, Toyama, Yokohama and Okinawa. In Bulgaria, Viktor Valkov appeared in performances with most of the major orchestras and at most of the important music festivals. In 2003, he received an invitation from the New Symphony orchestra, and conductor Rossen Milanov, to perform Dimitar Nenov’s Grande Piano Concerto. Thus he became the fifth pianist to perform that concerto and the only one to do the entire version. In 2007, Mr. Valkov made his debut with the Sofia Philharmonic Orchestra. Mr. Valkov’s concert activities reflect a vast interest in the chamber music repertoire, as well as lesser known piano music. He frequently performs in a cello and piano duo with the Bulgarian cellist Lachezar Kostov. Both being deeply interested in broadening the repertoire for that medium, they often include in the programs composers like Kabalevsky, Roslavetz, Schnittke, Saint-Saens (the Second cello Sonata), and others. Their close friendship and professional collaboration began in 2000. In 2009, the Kostov-Valkov Duo gave their Carnegie hall debut at Zankel Hall. In 2011 they won the Liszt-Garisson International Competition, where they were awarded First Prize, the overall Liszt Prize as well as all the special prizes in the collaborative artists category. As a solo performer one of Mr. Valkov’s last projects featured Busoni’s Fantasia Contrappuntistica as the focal point of his concert programs. During the 2011-2012 season, Viktor Valkov presented a program of music from the 1600’s including composers like Froberger, L. Couperin, Frescobaldi, Buxtehude and selections from the Fitzwilliam Virginal Book. Mr. Valkov has made a number o f recordings for the Bulgarian National Radio archive, many of which have been broadcast. He has also recorded for Bulgarian National Television and the Macedonian Radio and Television. In 2008 he recorded the entire music for cello and piano by Nikolay Roslavets in collaboration with cellist Lachezar Kostov. This CD was released by NAXOS in March 2011. Viktor Valkov studied at the State Music Academy in Sofia, Bulgaria with Prof. Stella Dimitrova and subsequently in the Folkwang Hochschule in Essen, Germany with Michael Roll. In 2006 he enrolled at the Julliard School and earned his Masters Degree studying with Jerome Lowenthal and Matti Raekallio. In the fall of 2012, Viktor Valkov started pursuing a DMA Degree at Rice University, Houston with Jon Kimura Parker.